We offer a range of material handling extras on our truck and track mounted platforms enabling increased versatility and flexibility allowing your job to be completed safely and efficiently. 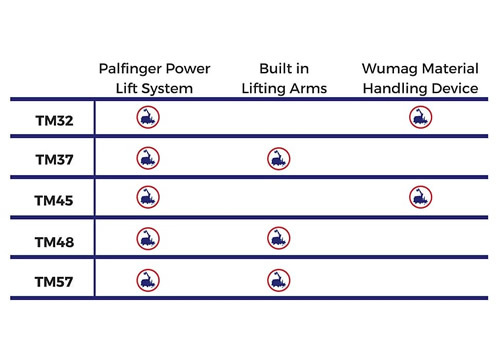 The Palfinger Power Lift mounting system is a part of the workman basket and allows operators to securely store and carry materials. Manufacturer fitted lifting arms and the Wumag Material Handling Device allow for the safe lifting of glass and other sheet like materials and is particularly popular within the glazing and signage sectors. The table below gives an example of the attachments available within the Wilson fleet. If you would like to discuss your project in further detail, please call our experienced team on 0844 288 9338 who will be happy to help advise on the machine and accessory most suited to your application.